Cinco de Mayo is coming up and this margarita is perfect! For this recipe I used my ice cream machine to get these margaritas nice and icy. I hate when margaritas are watered down, which is why I hate adding regular ice cubes. When you use this method, your margarita can also double as a dessert. After about 15-20 minutes in the ice cream machine, the mixture is the perfect consistency for a great margarita. If you freeze the mixture, it becomes refreshing hibiscus margarita sorbet. Try serving the frozen sorbet with a little tequila or champagne on top. Place hibiscus flowers and vanilla bean in a saucepan with the cup of water and bring to a boil. After water is boiling remove from heat, cover, and let sit for 20 minutes. Strain mixture to remove hibiscus flowers and vanilla bean. Add mixture back to pan and add sugar. Simmer for about 5 minutes until sugar is dissolved. Remove from heat and add lime zest, lime juice, orange juice, and tequila. Chill mixture until it has cooled completely. Once mixture is cool, place in your ice cream machine and process according to manufacturers instructions. After about 20 minutes, mixture is ready to serve. You can also freeze and serve as sorbet. Wow, what a brilliant idea to use an ice cream maker to achieve that margarita slush! I am definitely going to try this. Your hibiscus margaritas sounds and look delicious. I can’t get over how much I love your recipes! Thank you so much! I really appreciate that. I’m glad you like the recipes! Looks delicious perfect for cinco de mayo!! Love how from-scratch these are… Summerlicious! You read my mind…I think this will be perfect on a 90 degree day…. “Agua de Jamaica” hibiscus tea is one of my favorite refreshing drinks – how zany and brilliant to push it to the next level with tequila! I am so down. Thanks! hibiscus tea is one of my faves as well! I don’t drink, but perhaps a virgin modification on this recipe? Congrats on being freshly pressed! yum going to try these this weekend! What an amazing idea! I also hate it when frozen margaritas get too watery. Unfortunately, I don’t have an ice cream maker yet. I plan on getting one as soon as I get my KitchenAid mixer. Beautiful and yummy! It’s not #wine, but it is a great party solution to better #margaritas! The vanilla bean just gives it a slight vanilla flavor you definitely don’t have to add vanilla. You could also just use vanilla extract too. The seeds from the vanilla bean won’t really change the texture of the margarita but you will be able to see brown flecks of the beans throughout the margarita. Holy cinco de mayo, I just found what I’m drinking after work today. A-maz-ing. There are lots of Hibiscus flowers where I live, so will definitely try this soon. Great idea, would love to get tipsy on these! The ice cream maker idea is genius–I’m not sure where I can get my hands on hibiscus flowers, but I’ll definitely try the technique! Now this is amazing after a long week. I’m a event coordinator for Breast cancer and it’s quite a week hearing the stories of pain and who has recently been diagnosed with cancer. At the end of the week a nice chilled drink works especially in the heat of Tampa Florida. good job on making the front. They look too pretty to drink. I will definitely be trying this over the summer, they look wonderful! You can definitely omit the tequila and add any fresh fruit juice that you like. You can also double the recipe so there is more liquid to fill your ice cream machine. You will probably have to cut the sugar in abut half too. This looks great and not too difficult. I might just need to give this a try! Thanks for sharing and congratulations on freshly pressed. A friend gave me some hibiscus flower powder. Maybe I’ll have to try these out using some of that! One of my all time favorites are Prickly Pear Margaritas. I have a recipe at: http://sarahsjoys.wordpress.com/2011/09/10/prickly-pear-margaritas-from-scratch/ if you are interested. Thanks for a new margarita to try! They will go well with our fish tacos tomorrow. 🙂 Congratulations on being freshly pressed! Sounds very interesting! Will love to try some of this, never had a hibiscus margarita before 🙂 Innovative, great job! Thanks for sharing! Hi there, what is cinco de mayo?! Cinco de Mayo is observed in the United States as a celebration of Mexican heritage and pride, and to commemorate the cause of freedom and democracy during the first years of the American Civil War. Most people use it as an excuse to drink margaritas! I love the look and feel of a Hibiscus flower – they are the typical island flower that just screams Summer! So when I saw them cleverly worked into a margarita recipe I just stopped and said ALOHA!! Make your next barbeque beverage a little bit special … or what the hey – consume one just because it’s Wednesday … we all need some floral tributes in our lives! Well yummo!! Had to reblog that!! Thanks for posting! nice sure i will try…. clever use of an ice cream machine–and they look so pretty too! This is great! I’m trying it with a hibiscus tea. Do you ever cook with tea? Look up Cynthia Gold and Culinary Tea. She’s an amazing woman and chef with an amazing book. From what I know, Hibiscus is a Gumamela…we only use that to make bubbles…never thought it can be turned into a margarita…INTERESTING!!!! Um, YES! Looks like the specialty marg I was searching for on Cinco de Mayo. Thanks for writing! Visit me at theusualbliss.com sometime! wow that looks absolutely amazing. hope it tastes as good as it looks! i bet it does! Went to my first Cinco de Mayo party today – it’s not really celebrated here in the UK. Had some great margaritas but I LOVE the look of your Hibiscus ones. Stunning colour. Sadly I don’t have an ice-cream maker, perhaps I should invest in one. Congrats re getting freshly pressed. This recipe sounds yummy! Thanks for sharing. Would love to try these sometime. Great post. Glad I checked out your blog! i was delighted to see that someone else loves pairing hibiscus with tequila! it makes a beatiful presentation, and i love the ice-cream maker concept. i have to try your recipe. I love quinoa! thanks! The “quinouli’ follow up was about the breakfast fritatta that was really really good. Luckily I live where quinoa is grown, and a bag costs — (are you ready?) $1.33! Your post made me smile, as I too, love using hibiscus in drinks.. substitue pisco and you have a piscorita, quite nice with the hibiscus as well. Although I doubt if an ice-cream machine could be found anywhere near where I live, I loved your concept and look forward to when I can try that method! If this came through twice, perdon! The connection was lost just as I hit the “Post Comment” button. 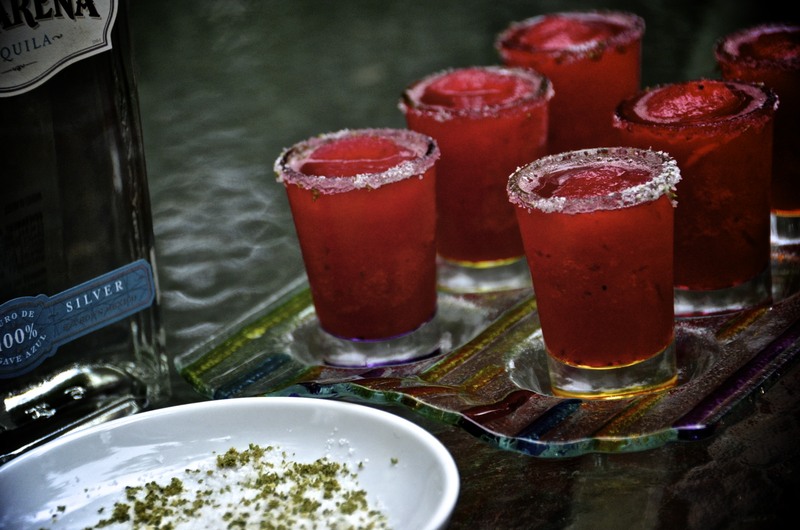 I’m definitely making those yummy margaritas next weekend, they look awesome! Thank you for sharing the recipe. Thank you! You may be able to find hibiscus tea or a tea blend with hibiscus in it. I have some red zinger tea. Would that do? A delicious way to fight this dreary grey weather! sub the sugar for agave. 2 parts agave for every 1 part tequila. I promise you, you’ll never go back. Reblogged this on Impulsive Heartbeat's Blog. Looks delicious!! !yummy,the mixture is the perfect consistency for a great margarita. Beautiful post and taken very good colour photographs of icecream.Thanks for sharing.I like to eat icecream,specially in summer season. Yummy! Sounds like they might even be good for you with all those great ingredients! We just came home from mexican food, I’m parched, sit down at my computer and look at those beautiful drinks. How I wish one was sitting in front of me right now! Those look delicious! I must try this. Great blog idea. Oh yeah. I can taste this already. Hello, Your blog is great. Simple design and very useful, keep update your blog, I will frequently visit your blog. I am very happy if you put my blog in the blogroll on your blog. I will also put your blog on my blogroll. Let me know if you are also interested. We drink hibiscus tea all the time and remark how pretty the color is. It was on our list to make something with it to use that glorious color. This is a great idea! Since we live in a dry community, we may go for the sorbet version instead of the margarita version. Thanks for posting this. The lime and the orange will make the true margarita taste. May I get a taster? What a beautiful color, and they sound delicious! these look amazing! i’m sad i didn’t stumble across this blog before i drank watery margaritas on cinco de mayo – but luckily, every day is a good day for a margarita. This looks amazing…can’t wait to try it. Also…where did you get the beautiful glasses and serving tray? The presentation is splendid! This is first time to the site. I saw a link from another blog and clicked over. mmmm my mouth is watering and it is only 8.30am…………..these look good. ice cream shaker/ why didnt i think of that…..this is epic!!!! Nice post and thanks for the good recipe. Right now it’s a little early, but boy that looks mighty tasty! What I want to say….it must be very very delicious…Thanks for sharing. I wanna try this at home, too! But can I use hibiscus tea bags instead of dried hibiscus flower? I only get to buy organic hibiscus tea bags. Begging your pardon, but did you post a quantity? I’m dying to take this to a party but need to know how much to bring. It looks like it makes about 12 oz (1.7 cups) as-is.